I'm entering this into Simon Says Stamp Anything Goes challenge.. Isn't this fox adorable??? I'm selling Close to My Heart, so it's only fair that I let you know that You can only get the Spring Critters stamp set until April 30. I watercolored the image. It was so fun to do. As you all know, I decided to take the plunge and join Close to My Heart as an independent consultant. For as little as a $150 party, you can earn select rewards from Close to My Heart, and I always give the hostess with a qualifying order of at least $150 a surprise gift as well!!! That's right! 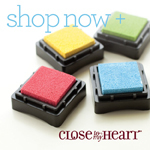 I decided to join Close to My Heart (CTMH) as an independent consultant! Join the April Sales -Please Join gathering. to order and have it delivered straight to your home. Plus, when you spend $50 or more, you can get the Life in Pictures stamp of the month for only $5 (plus s/h and tax)!! I love it!!! I made this birthday for my sister in law. It fits the challenge at Simon Says Stamp: Happy Birthday. and happy birthday to them!